Posted by Dr. Krishna Kumari Challa on July 22, 2017 at 10:03am in Science Simplified! Microbeads are tiny plastic particles (usually spherical in shape, that range in width from a fraction of a millimeter to about a millimeter and a quarter) which are found in personal care products such as exfoliators, toothpaste and shower gels. They are most frequently made of polyethylene but can be of other petrochemical plastics such as polypropylene and polystyrene. Since their introduction in 1972, they have made their way into more than 100 personal care products sold by several prominent companies. However, they are an environmental and health hazard. They're used in soaps because exfoliating products need small, hard particles to rub debris from the skin. These particles can be natural materials, such as ground nut shells or crushed apricot seeds--or they can be manufactured products like microbeads. While microbeads are no better at scrubbing the skin than particles of shells or seeds, they're much cheaper to mass-produce. Which is why, since the 1990s, manufacturers have increasingly replaced natural materials with plastic shards. When we wash those things out, this plastic-laden wastewater goes through treatment plants, about 99 percent of the beads settle into sludge, which is often used as fertilizer. Thanks to rain and runoff, these beads can still enter the water supply. Meanwhile the one percent that escaped the sludge—roughly 8 trillion microbeads—are released directly into our waterways. The world’s oceans and other water bodies are drowning in human rubbish, mostly plastic. Each year more than 300 million tons of plastic are produced globally, and 10 per cent will end up in the sea. It is estimated that there is now a 1:2 ratio of plastic to plankton and, left unchecked, plastic will outweigh fish by 2050. Not only is the floating haze of scum unsightly, it is also swallowed by marine animals that cannot digest it. Plastics used in microbeads readily absorb pollutants . And to a hungry aquatic organism, little pieces of plastic look pretty tasty. The smallest microbeads can even become food for plankton, and travel all the way up the food chain.Chemicals leach into the water, and it has been shown that even humans who eat seafood ingest 11000 pieces of microplastic each year bringing harmful chemicals into the their bodies via the food chain. The rate of plastic pollution is expected to increase as more and more plastic is used globally, especially in emerging economies with weaker waste and recycling regimes. Because of these harmful effects of plastic beads, environmentalists are asking the governments around the world to ban them or atleast restrict their use. You too can do your bit to protect yourself. 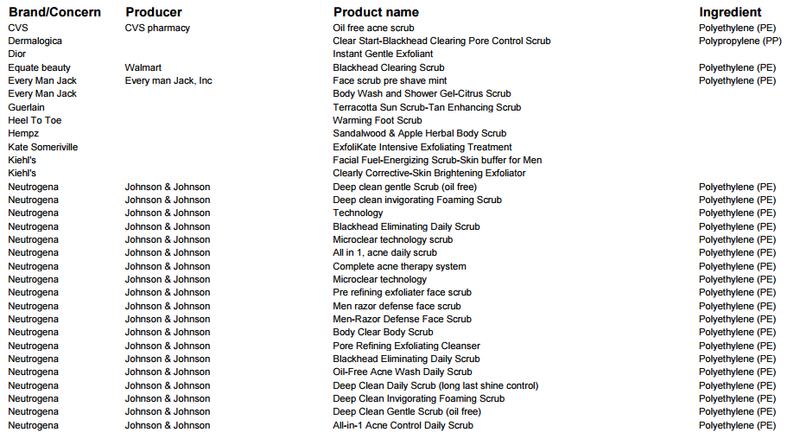 Refuse to buy products that contain these microbeads. Instead use home-made products that can exfoliate, scrub or clean effectively. 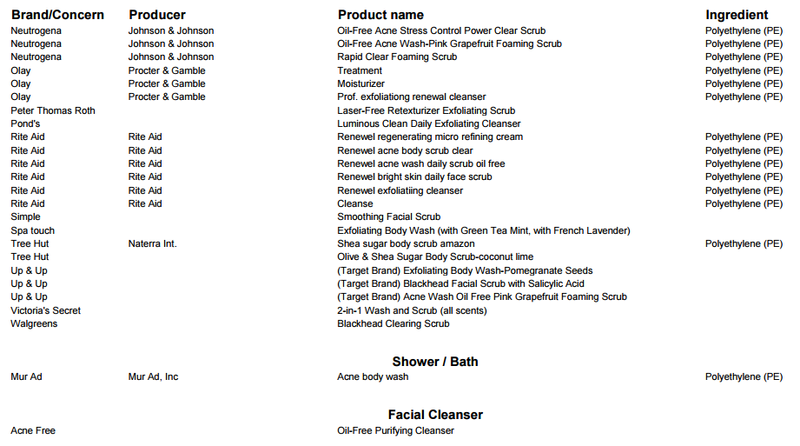 This is an old list made in 2015 and you can find the microbeads in more products now.